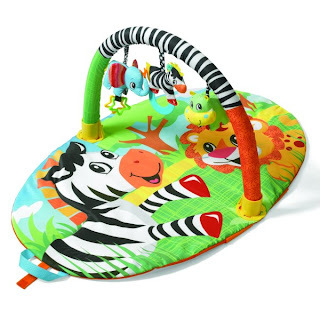 Super-soft travel activity gym with bold animal patterns and hanging toys to stimulate baby’s senses and keep them entertained. Suitable from birth. Little E loves to lie on her back and watch hit her hand against the arch to watch the animals wobble. She can't actually reach the animals to play with them as they are just a touch to high so we sometimes add additional toys on to the arch that she can reach. This is a great travel toy - it folds in to a plastic carry case and we tend to leave it in the car boot when it's not in use so that wherever we might end up Little E always has something to play with. (Amazon.co.uk £23.95)Designed to give children the freedom and independence to stand upright whilst being fully supported, they provide a new sensation and perspective of the world for babies. Suitable for babies old enough to support their head, until they can walk. Little E loves this. It took a bit of getting used to at first and she wasn't quite sure what to make of it, but once she figured out that she was in control she was bouncing away. I think she enjoyed being upright and not being held by someone. She didn't even get fed up or bored like she does with other toys and of course Mister A thought it was hilarious so then he wanted a go. Try explaining to a 3 year old that his sister can have fun with something but he can't! A great buy, a good price and it can be handed down as your family grows. As well as being a clever two-in-one supportive play nest and prop to help your growing baby sit up, this deluxe sit-me-up has a removable play arch and tummy-time pillow to give your baby even more options to learn, move, play and develop. Use one cushion or stack the two cushions together for greater upright support for older babies. This is a great play toy that will last from birth and beyond. When your baby is young it can be used as shown in the picture - with the 'flower shaped mat' nestled in the inflatable ring (which is actually in two separate parts.) As your baby gets older you can lay your baby on the mat with the mini pillow for some tummy time and then when your baby is old enough to start trying to sit you stack the to parts of the inflatable ring on top of each other as a support. Great baby toy and although quite costly it will last.